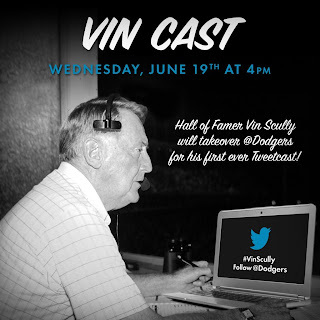 Thanks to SoSG Dusty for transcribing Vin's tweets from last week. Enjoy! Hi everybody and a pleasant Wednesday evening to you, wherever you may be. I broadcast the Yankee/ Dodger World Series in '53, '55, '56, '63 and '81. No way I could have imagined tweeting a game. Ebbets Field is gone. Old Yankee Stadium is gone & I haven't been to the new one. New York is basically a city of memories for me. I don't miss the long travel and the long days away. There's not much left for me in New York. [Upon telling Vin he is already trending in the United States] Wow! Hot diggity dog. Well, Puig just bunted for a base hit. Hanley Ramirez has 5 hits in 10 innings! Five straight hits to start the game. That's pretty good. I walk outside the booth before games to loosen up the legs. I stand almost every half inning. That feels good. Two of the biggest thrills: One would be Larsen's perfect game, and the other would be the Dodgers winning the '55 World Series. When I was 8 years old, I knew. I wrote a composition for the nuns and said I want to be a sports announcer. Growing up Red Barber, Mel Allen & Ted Husing were the top 3. Al Michaels, Jim Nantz and Bob Costas just to name a few. I can't say, but the best player I ever saw was Willie Mays. Statistically, Mickey Mantle might have been better. I'm looking at Yankee Stadium and it looks so different from the old one. The question always was - did anyone ever hit a ball out of Yankee Stadium? The closest was Mickey Mantle. They say it went 118 feet in the air and missed about 18 inches from clearing the roof. The scariest in broadcasting for foul balls, old Briggs Stadium. The booth was so close to home you could hear the hitter grunt. [On the #NBAFinals] "I thought San Antonio would have won it by now, so I'll stay with them." Got him at second base. What a play, wow. Andre Ethier just made a really good play. Right on the money to Ramirez. I think Andre Ethier has done a really good job in Center Field. Especially for someone who has played Right Field for years. Being a traditionalist, I don’t like the DH. @TBrownYahoo Hi Tim. What a twist, reading me! Now here's Puig, watch his head. That last at-bat he was swinging wildly. Whoa, did that get him? Yeah. Yasiel Puig has just stolen second. He can sure do it all. HBP, stolen base, ground out -- now he's at 3rd base. 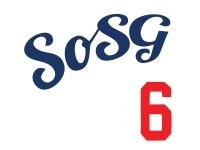 Hanley Ramirez is 6-for-7 today. Wow. Four-nothing. Phil Hughes has not fooled anybody. The Dodgers have some pretty good batting averages compared to the Yankees. [Q: Hey Vin, I read your article in #golfmagazine. What is your lowest round?] My lowest round was 77, but only once. It was amazing -- everything went right for a hacker. [Why MLB?] I did the NFL for about 8 years, PGA for 14 and a few of tennis matches. I played sandlot ball. I played in college. Unless you've played baseball, you don't know how difficult it is. I once played against George H. W. Bush. He played 1B for Yale, and I played CF for Fordham. We both went 0-for-3. Holy Mackerel, it's Puig! He is unbelievable. Yasiel Puig has got a bunt single, a stolen base, and a home run. He is unbelievable. His talent is absolutely breathtaking. I’ve never seen anybody do what he has done in such a short period. He’s been remarkable, a 5-tool player who constantly shows the tools. Kemp back, and Crawford back, to go along with Gonzalez, Ramirez and Puig. I have to believe they’ll make a run. Chris Capuano was remarkable. Just off the disabled list and to pitch 6 innings and not walk anyone. I’m very happy for him. It looks like Puig and Ethier have a nice relationship out there. I'm with them in spirit, but also in body. I'm thinking let's get them out of there so they can get some sleep. Because of the rain delay, it's a really rough day. 8am you get up. By the time you go to bed in SD, it’s been almost 24 hours. There you go, that's one. [In response to all of the 'thank you's,'] Well, I don't think I really did very much. Thank you all. Thanks so much for joining me on Twitter and good night. 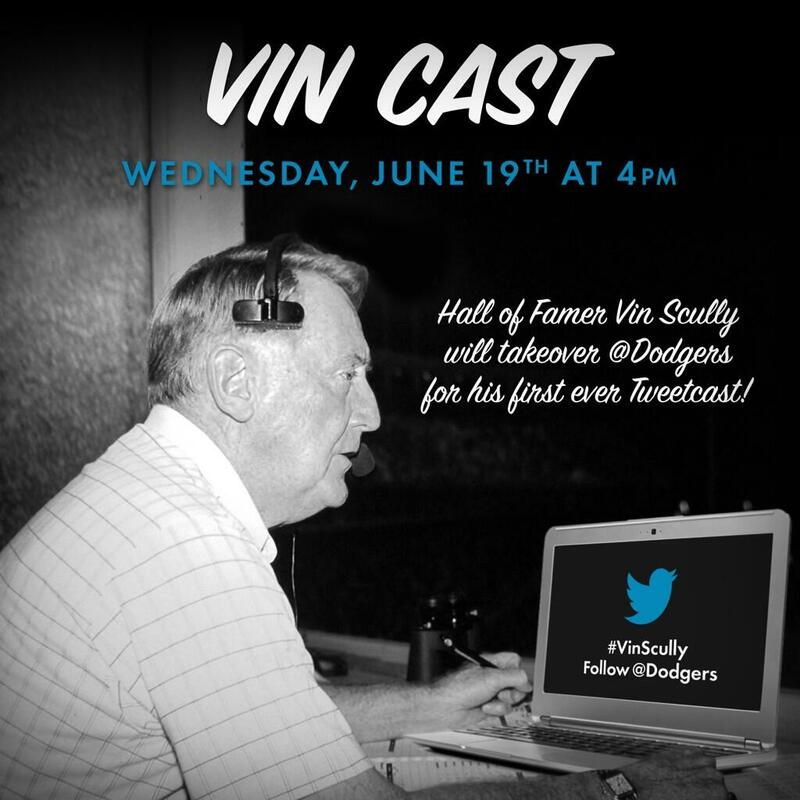 Reading the tweets in Vin's voice is awesome. Thanks for transcribing these. Thanks. I saw a few but not all. good job! excellent - thank you, Dusty!